Cymbidiums are native to the foothills of the Himalayas and are accustomed to cool conditions. Their tall spikes have from 10-25 flowers ranging from 2 1/2" to 6" which last from one to three months. Many are fragrant and their long leaves make them attractive as indoor plants. It is essential to grow Cymbidiums outdoors from May to early to mid-October. They like night temperatures to fall below 58 degrees. These cool temperatures will initiate the flower spikes. They will tolerate temperatures as low as 35 degrees. When the plants are brought indoors in the fall, place them in a bright (south or east window preferably) cool section of your home. Humidity may be provided with the use of a humidifier or the tray and gravel method. Just make sure that the plant is not standing in water or the roots will rot. When growing Cymbidiums outdoors, place the plant where it receives bright defused light such as through a pine tree or shrub in early morning. Very light afternoon sun works also. When you bring them indoors, give them as much light as you can (south, east or west windows). For tap water or well water, we recommend fertilizing with Grow More 20-10-20 once every 2 weeks from March through September. And once each month through February use Grow More 6-30-30. During the growing season, which is generally spring, summer and fall, cymbidiums should be watered frequently and heavily; in winter, with less sun, watering can be somewhat reduced. Except for the period immediately after potting, the growing medium should be kept moist at all times. A fine spray over the foliage, in addition to pot watering, is beneficial unless the weather is cloudy. These plants have long thin leaves what are prone to tiny, almost invisible spider mites on the undersides. To avoid getting the mites, take the plant into the shower once a month and spray the foliage lightly with room temperature water. If you have spider mites, insecticidal soap sprayed 3 times, one week apart, should control them. Many different potting media have been used for cymbidiums-straight osmunda, fiber, rockwool, or fir bark, mixes of loam, dried oak leaves, and redwood fiber, or various combinations of standard horticultural materials. The important thing is to have a light, porous medium, capable of holding moisture but draining thoroughly. When plants need to be divided and repotted, do it in the spring after blooming. Repot only when the medium has broken down, for cymbidiums do best when not disturbed. Cymbidiums produce an extensive root system and may be "overpotted" more readily than other orchids. Select a pot which, once the plant has been placed in the center, allows space for at least two years' growth. Remove all dead or dying roots from the plant, carefully taking off the old compost without causing damage to the live roots. Should you wish to divide your plant at this time, each section should have three or four green bulbs in addition to any new leads. 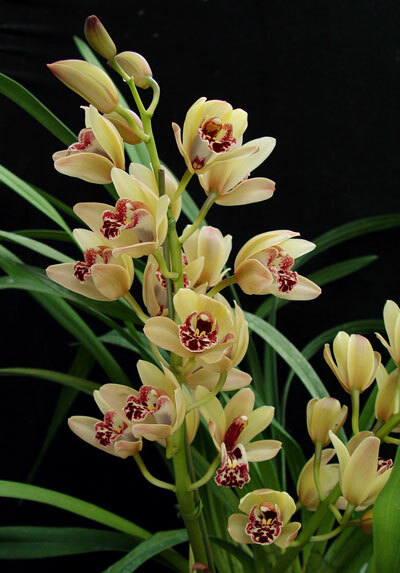 As cymbidiums are particularly susceptible to a number of diseases, it is now standard procedure with them and any orchid for that matter, to sterilize all cutting and potting instruments before using them on a new plant. Backbulbs, or the old leafless pseudobulbs, should be removed if the procedure will cause no damage to the rest of the plant.